Each piece is individually hand-formed -- either wheel-thrown, hand-built or a combination of the two. The clay is a stoneware fired to 2250-2350ºC in either an oxidation (electric) or reduction (gas) atmosphere. We formulate and mix our own glazes. The finished products are safe to use in the microwave, dishwasher, or oven -- and suns, fountains and other outdoor pottery can be left out all year round. 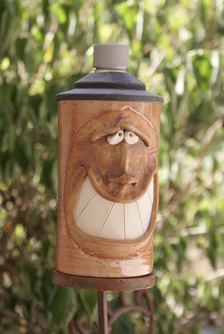 Our pots are made to be used daily, combining art with function. 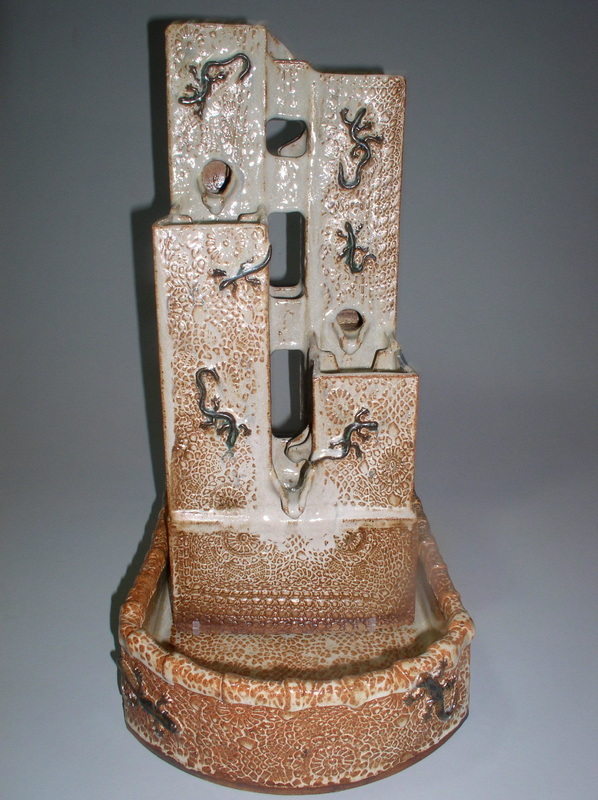 Deirdre (De) and Derek (DJ) Johnson established D2 Pottery in 1982. From 1982 to 2016, the D2 Pottery business traveled the globe -- held hostage to Derek's career in the Navy (Pensacola, FL; Virginia Beach, VA; Yokosuka, Japan), further education (Springfield, MO), and employment (Los Alamos, NM, Fredericksburg, VA, & Omaha, NE). During those travels, one of the first things De unpacked was the wheel and kiln -- and soon thereafter De was either participating in craft shows, showing her wares in local galleries, or passing her skills on to students. In 2016, De and Derek moved out to Estacada, Oregon, where they are continuing the process of expanding the part-time business into one that will support them both in the way that they would like to become accustomed to. Both De and Derek are involved equally in every stage of the process: forming pots, trimming pots, firing, loading and unloading kilns, and glazing. Their pottery has been widely exhibited in numerous art fairs, galleries and boutiques all across the country. "Our goal is to create something of simple and/or whimsical beauty that will be used and enjoyed on a daily basis for generations to come." We primarily market our wares via shows and galleries, but are in the process of creating a web-based sales presence. It can be accessed via: https://www.etsy.com/shop/TheSpiralGallery. If you do not see what you want via Etsy, please feel free to contact us via phone or email.